Cars need some protection from the hot weather to ensure that they run optimally and don’t end up with cracked upholstery. As for those traveling inside the car, the minimization of heat is essential. Use a windshield sun shade. This is usually something that folds out and then folds up easily for storing behind the seat. If you put up a shade every time you use the car, it’ll help cut the sun’s rays and can reduce a bit of the heat. While you can use just one for the front, a back window shade can also be helpful for some car types. Protect the upholstery and dashboard with products. There are products available that can provide an additional protective layer, such as vinyl or leather protectors. Consider getting tinted windows. 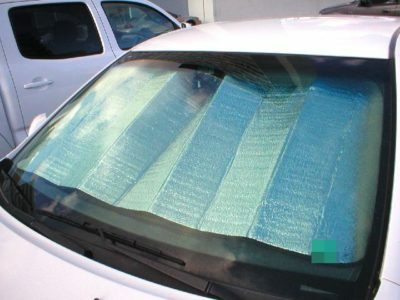 If you leave the car parked in the sun a lot and it causes cracking of the upholstery, etc., tinting may be an option. However, you’ll need to check the local regulations as some jurisdictions don’t allow tinted windows for safety or other reasons. Park in the shade. Wherever possible, find shady or indoor car parking during the hottest parts of the day. In some places this is possible if there are car parks lined along a park or in leafy neighborhoods. Obviously, many places lack trees for shade but check out building shade––try to look for streets where the shade created by buildings will be passing over your car during the hottest part of the day. Check the car’s battery. Excessive fluid evaporation can reduce the life of the battery. If it’s the type of battery that needs liquid top-ups, add distilled water when needed. Keep an eye on the coolant. This should be topped up when needed. Of course, don’t open the radiator cap when the car is still running hot; wait at least an hour after using the car before opening. Travel when it’s cooler. Try to target your driving times for the cooler parts of the day, such as early morning or late evening. This will make it a lot more pleasant for both the driver and any passengers.